The tone is slightly darker for the second of the series and, unsurprisingly, there are plenty of the same locations, though ‘Privet Drive’ is recreated in the studio. Pity poor King’s Cross Station. After years of being overshadowed on screen by its more photogenic neighbour, the Victorian mock-Gothic St Pancras Station, King’s Cross finally got its moment of glory through the Harry Potter series. But, although its platforms appear again as Harry, Hermione and Ron fail to catch the Hogwarts express, the Weasley’s Ford Anglia takes off in front of screen-friendly St Pancras (now, of course, St Pancras International, home of the Eurostar terminal). 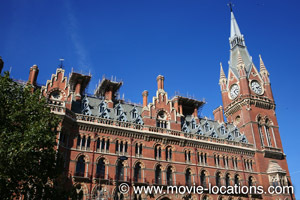 The fantastic exterior of St Pancras has graced many films, though never more unusually than as a royal palace in the imaginative 1995 film of Richard III, with Ian McKellen. The Weasley house was built on Gypsy Lane, near the village of Abbots Langley, opposite the film’s base at Leavesden Studios in Hertfordshire. On its way to Hogwarts, the Ford Anglia lands on Glenfinnan Viaduct, on the West Highland line between Fort William and Mallaig in Scotland. There’s a regular diesel service, but if you want to cross the viaduct in a traditional steam locomotive, West Coast Railways run the Jacobite Steam Train during the summer season (May to October). The viaduct was also seen in WWII drama Charlotte Gray. 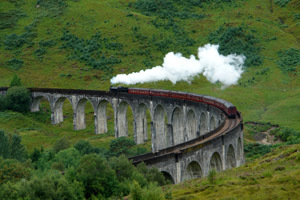 Also in Scotland, the dramatic landscapes around Hogwarts were filmed in the area of Glencoe. And, although most of the shots of Hogwarts are digitally created, some familiar locations are revisited for individual scenes. Harry and Ron's arrival at the school in the battered Ford Anglia is Alnwick Castle in Northumberland; and the cloisters of Gloucester Cathedral, Gloucester once again become the corridors of the wizard school. Similarly, Durham Cathedral appears again as Hogwarts quad, where Ron begins to regurgitate slugs after his spell backfires; and its Chapter House becomes the classroom in which Professor McGonagall teaches the young wizards to transform animals into water goblets, and reveals the story behind the Chamber of Secrets. The cloisters of Gloucester Cathedral, Gloucester, become the corridors of Hogwarts in which Harry finds “the Chamber of Secrets has been opened” written in blood on the wall. There’s a return to Oxford University, too. Hermione researches the polyjuice potion in Duke Humfrey’s Library; and its on the staircase outside the University’s Great Hall that Harry in flashback sees the meeting between Dumbledore (Richard Harris) and Tom Riddle. 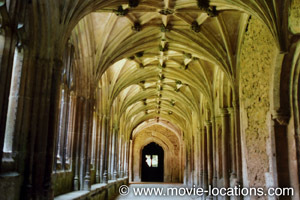 The hushed classroom, in which Harry becomes the object of suspicion after speaking parseltongue, is the Chapter House of Lacock Abbey (which you might remember from the previous film as the room in which Harry discovered the Mirror of Erised), and the corridor outside is the Abbey’s Cloister.